Finalists for the annual Cartes trade show awards include Taiwan-based Go-Trust, developer of a single wire protocol compliant NFC microSD card. 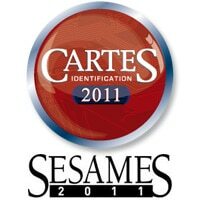 Eight NFC products and services have made it to the final stages of this year’s Sesames awards, organised in conjunction with the annual Cartes trade show in Paris. Garanti Payments Systems‘ BonusluAvea NFC payments and loyalty service, which uses Gemalto’s N-Flex SIM+antenna solution, is a finalist in the hardware category. Oberthur Technologies‘ NFC e-Wallet, used by Etisalat in Africa, and NXP‘s open source NFC host software stack for Android are both finalists in the software category. HID Global‘s next-generation secure identity ecosystem is a finalist in the identification and ID cards category and in the trusted internet and authentication category. Turkcell‘s Cep-T Cüzdan mobile wallet service and Watchdata‘s SimPass NFC add-on are both finalists in the banking, retail and loyalty category. NXP‘s PN65 secure NFC module, which is to be used by Sony Ericsson in its forthcoming NFC phones, is a finalist in the mobility category along with Go-Trust, a new name in the NFC market. The company’s SWP microSD product is the first microSD format NFC device to conform to the single wire protocol (SWP) standard and is being used in China UnionPay’s commercial NFC service to add an external secure element to NFC phones equipped with an internal antenna and controller. The winners in each of the ten categories will be announced at an awards ceremony on 14 November.